One of the best things about a tropical flower bouquet is that the flowers enjoy great longevity which means they remain vibrant in the vase for longer. Tropical flowers are exotic in appearance, they are many types of tropical flowers and they are diverse in color, appearance, fragrance and texture. 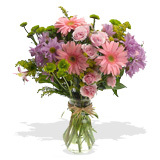 Tropical flower bouquets light up any room they are placed in. Discount tropical flowers are a real bargain as not only are they cheaper, but the added bonus is their vase life is longer than normal flowers. An Insight into buying a woman flowers: A recent consumer research has shown that buying flowers for your woman will make a lasting impression, showing that 92% of women can remember the last time they received flowers, and 89% say receiving fresh flowers makes them feel special. "If the way to a man's heart is through his stomach, then the pathway to a woman's heart is through her other senses," says Cole, author of Flower Power. "Fresh flowers are a sensual gift that can express any emotion so simply – with just a little knowledge and a phone call to your online florist shop." Research shows that 96% of women like to receive flowers when they're not expecting them. "Guys should know that they don't have to wait for a special occasion to give flowers," Cole says. "Make an occasion by sending flowers to the woman in your life, just because. They'll never forget it."